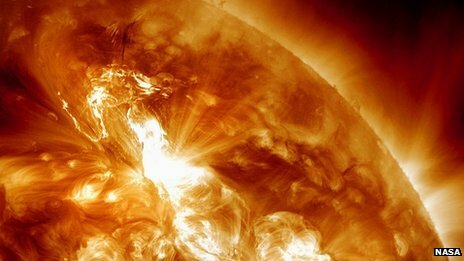 Our planet is being bombarded by high-energy particles unleashed by the strongest solar storm since 2005, scientists say. The charged particles are mostly a concern for satellites - which they can disrupt - and astronauts. But they can also cause communication problems for aircraft travelling near the poles. The geomagnetic storm has been caused by a potent flare that erupted from the Sun at 0400 GMT on Monday. The effects are likely to be felt on Earth throughout Wednesday. A more benign effect of the outpouring of particles is the ability to see aurorae, or "Northern lights", farther south than is usually possible. A spokesman for US space agency Nasa said that flight surgeons and solar scientists have modelled the flare's predicted effects. They decided that the six astronauts on the International Space Station do not have to take any action to protect themselves from the incoming stream of particles. Solar flares are caused by the sudden release of magnetic energy stored in the Sun's atmosphere. In an event called a coronal mass ejection (CME), bursts of charged particles are released into space. Nasa's Goddard Space Weather Center predicted that the coronal mass ejection was moving at almost 2,200 km/s when it was due to reach Earth's magnetosphere - the magnetic envelope that surrounds our planet - on Tuesday at 1400 GMT (plus or minus 7 hours). This can interfere with technology on Earth, such as electrical power grids, communications systems and satellites - including satellite navigation (or sat-nav) signals. In 1972, a geomagnetic storm provoked by a solar flare knocked out long-distance telephone communication across the US state of Illinois. And in 1989, another storm plunged six million people into darkness across the Canadian province of Quebec. But a spokesman for the US National Oceanic and Atmospheric Administration's (Noaa) Space Weather Prediction Center said the effects of this solar eruption seem likely to be moderate.